Minced shallots and sherry vinegar lend a real kick of flavor to this easy vinaigrette-style salad dressing. Have trouble tracking down sherry vinegar? Try a good-quality red wine vinegar instead, or, for a softer flavor, use cider vinegar. This dressing works well on a wide variety of lettuces. It's also a great fit when tomatoes are part of the salad picture. Peel and mince the shallot and put in a small bowl, a jar, or, if you're making the salad right away, in the bottom of a large salad bowl. 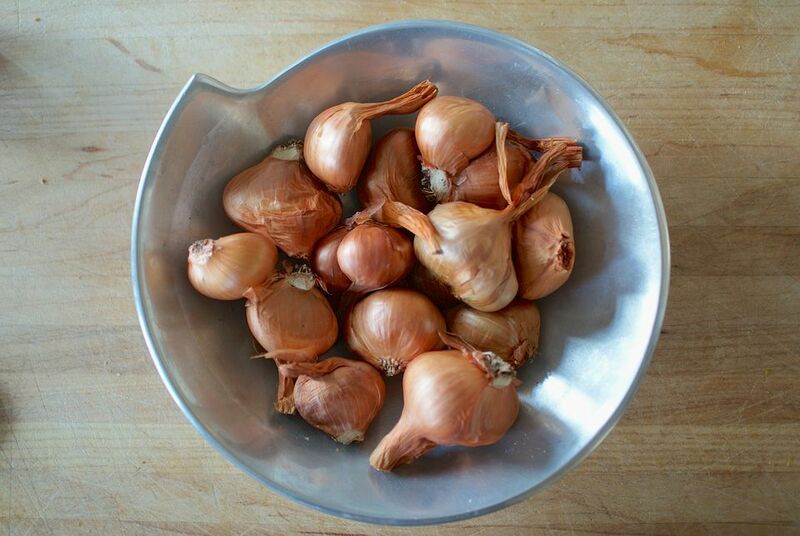 (If you're not looking for too strong of a shallot flavor, you can rinse off the minced shallots, spread them on a layer paper towels, and pat them dry before adding them to the dressing). Add the vinegar, salt, pepper, and mustard. Whisk (or shake jar) to combine. Let sit at least 10 minutes (this lets the vinegar mingle the flavors more effectively). Whisk in the olive oil. Use the dressing the same day, or cover and chill it for up to a week. Be sure to let the dressing come to room temperature before using so the oil returns to a fluid state (no one wants cold chunks of olive oil in their salad! ).